Trail stewards are important to both GORC and land managers. They are the eyes and ears of a particular park or trail. Trail stewardship is a term often used but not always defined. Let's define trail stewardship and the act of being a trail steward. They are avid trail users and enjoy nature. They actively show interest in a particular region or park. They have a sense of community and wish to volunteer to make their park a better place for all trail users. They wan to to assist GORC in its future trail building plans. They act as GORC's contact with a specific land manager. This mainly means keeping a consistent dialogue going so GORC is aware of the land manager's needs or concerns. The steward is the land manager's GORC point of contact. They assess a trail's needs. This can be minor maintenance, addressing a spot that won't drain/dry out and requires a reroute, or new trail scouting and building. The steward will relay information related to downed trees or other hazards to park staff or other authorized GORC sawyers as reported by other trail users online. They propose or request dates concerning the design, building or maintenance requirements of the trail. 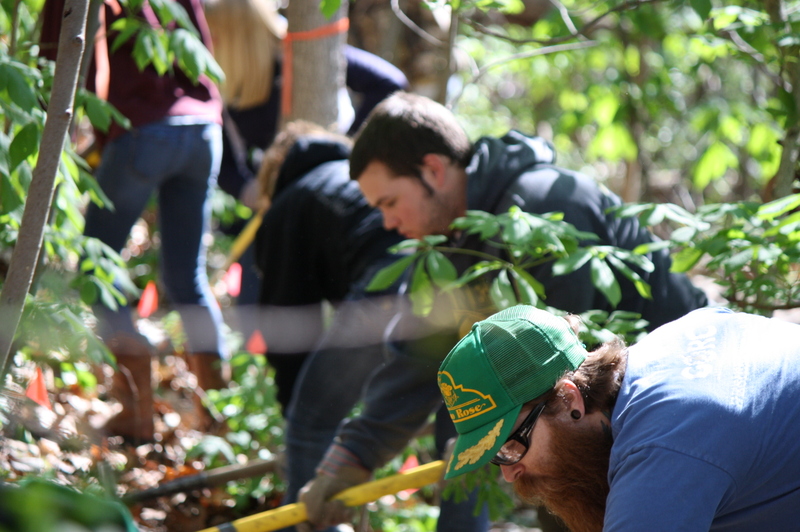 These dates may consist of volunteers culled from an "open call" on the forum, college/high school students looking for community service hours, Boy Scout Troops (or similar), or a full GORC trail building day. The scheduling is usually addressed through email to the other trail stewards and board members to set up the spring / fall schedules. They will be the point of contact for crew leaders and create maps and section points so the volunteers and crew leaders know where to go, what to do, and coordinate post-trailbuilding lunches. Ultimately, they are the "leader" of the park's trail building event and will task others with helping them run the event or manage it if they cannot be present themselves. They will "market" the trail online. This includes posting trail building announcements on the GORC forum, twitter feed and Facebook accounts. At the very least, writing the content to be posted and forwarding the information on to the “Social Media” person to post is very helpful. They will balance a trail's needs with the Spring/Fall GORC Trail Build Day calendar's available slots. They represent GORC in a positive manner as they are the "spokesperson" for their park and trail. Trail stewards grow to be the wise guru of their respective park as their increased interest and contact with the land manager keeps them in the loop. They keep an eye on their park by reading the GORC and stlbiking forums, by riding, running or hiking the park fairly regularly and listening to the concerns of other park “regulars” that keep them up to date via their own trail experiences. GORC is less concerned with a trail steward’s trail building skills than with their willingness to learn - and follow - the rules of building sustainable natural surface trail as defined by GORC and IMBA. Ultimately, the secret to being a great trail steward is something that cannot be taught or learned - and that is “Passion” for the betterment and continued health of their favorite trail and the park. A trail steward in many cases grows to become a major contributor to the operations of GORC. Many current and former trail stewards are now GORC board members or are in management roles and help guide GORC's day to day operations. Hopefully, this brief explanation should help clarify things a bit. Feel free to ask questions or make a comment over on our forum.